The Product Owner role is critical to maximizing Return on Investment (ROI) from agile projects and is one of the most challenging and rewarding agile roles. Many Product Owners come from business areas of the organization and have limited familiarity with elements of software development, project management and agile methods that are critical to success in the Product Owner role. For these reasons, it is vitally important that Product Owners gain a solid understanding of their role and responsibilities as well as the knowledge, skills and tools to work effectively with Scrum teams. 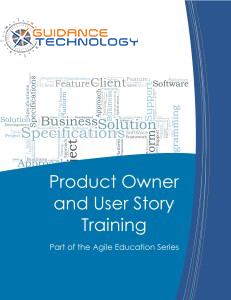 Free access to our Product Owner Certification Practice Exam. If you planning to get your Professional Scrum Product Owner certification (PSPO 1) from Scrum.org, our 80 question practice exam is a perfect way to prepare. All class participants receive free 30 day access to this practice exam. Guidance Technology also provides a certificate of completion of the course for each participant who successfully passes a certification test. This test is taken after the completion of the course and validates that participants understand the basic tenets of Scrum. This is a PMI Category 4 course that can be used for 14 PDUs. Guidance Technology’s Scrum courses will also meet 14 hours of the required 21 contact hours that must be earned in Agile project management topics as part of the PMI-ACP application process. Click here for more details.